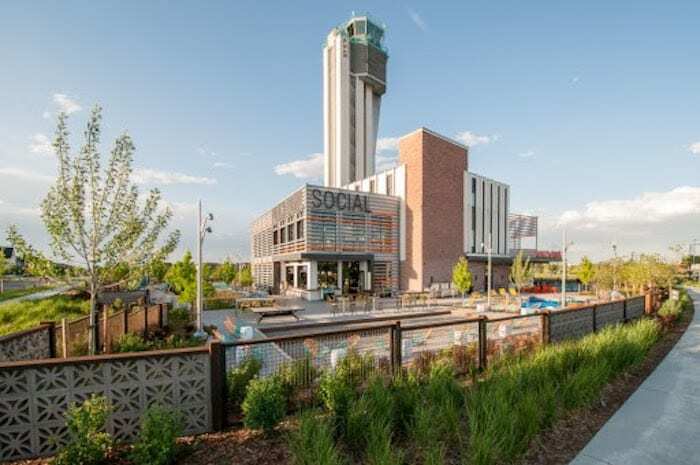 OZ preserved and transformed the former Stapleton traffic control tower into the newest local Punch Bowl Social. Since 2005, the awards have been presented to Denver homeowners, business owners, nonprofits, artists and others for their creative contributions to the public realm through innovative design. Winners can range from community placemaking projects to adaptive reuse of historic structures to single-family residences to major mixed-use downtown buildings. Each brings something special to Denver’s unique visual fabric and speaks to the community’s collective commitment to building healthy, sustainable communities. Backyard on Blake, 3070 Blake St.; Reimagining Learning Landscapes: Garden Place Academy Research Station and Community Garden, 4425 Lincoln St.; The Art Alley at Dairy Block, 1800 Wazee St.; Thomas Jefferson High School Bus Shelter, RTD Bus Shelter at Hampden Avenue and South Ivanhoe Street; 2200 California; Steam on the Platte, 1401 Zuni St.; Colorado Health Foundation Building, 1780 Pennsylvania St.; The Wheatley, 530 E. 25th Ave.; 2490 Welton St.; Botanic Gardens Ticket Centers, 1007 York St.; Molly Brown House Renovation, 1340 Pennsylvania St.; The Ramble Hotel, 2450 Larimer St.; River North Stormwater Outfall, Arkins Court, between 31st and 35th streets; Punch Bowl Social – Stapleton, 3120 N. Uinta St.; The Rainbow Crosswalk, Broadway and Irvington; The Circa Building, 1615 Platte St.; The Bosler House, 3209 W. Fairview Place; and Black and White House @ Sloan’s Lake, 4200 W. 23rd Ave. Published in the Dec. 19-Jan. 1, 2018, issue of Colorado Real Estate Journal.